Maze Rattan Tuscany Kingston Corner Dining Set: This large corner dining set is the ultimate garden furniture for both dining and relaxing. The popular Kingston design from Maze Rattan consists of a corner sofa which can seat up to 5 people, a 150cm x 90cm dining table and 3 footstools which can be used for either relaxing or as additional seating around the dining table. When not using this set for dining the table can be moved aside and the stools shared between the people relaxing on the corner sofa. This set is supplied in natural tones with complementary cream seat and back cushions which provide both comfort and style. 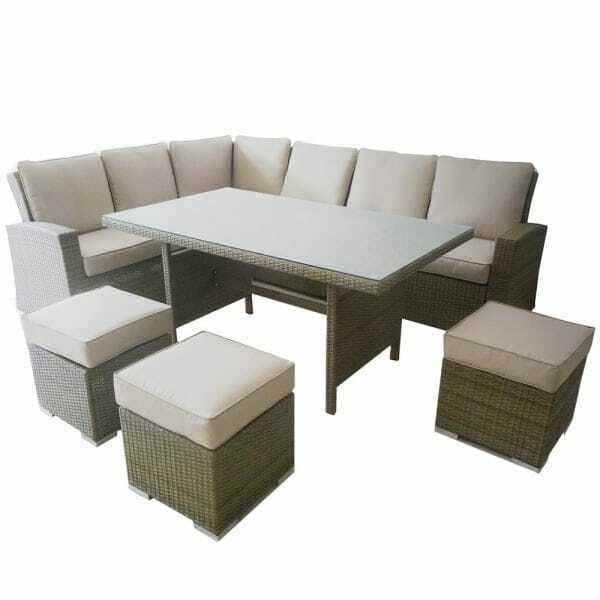 This rattan garden furniture set has a durable aluminium framework which will not rust over time and 100% weatherproof synthetic rattan which will not fade and does not require any maintenance and can be left outside all year round. For absolute assurance that you are buying quality furniture all Maze Rattan Garden Furniture comes with a 5 year manufacturer’s guarantee. For ease and simplicity this rattan dining set is delivered to you in easy to assemble sections.